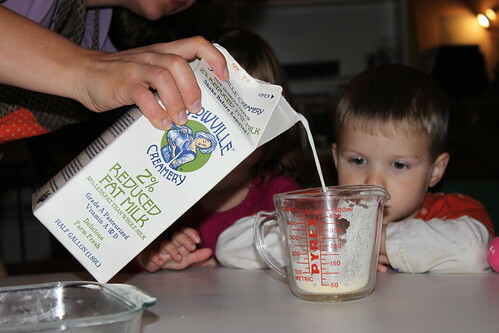 Buoyed by the success of recent Kids Cook classes, I hatched an idea: could I cook an entire meal with children? Then I questioned if we could use Ohio raised seasonal ingredients at the same time. 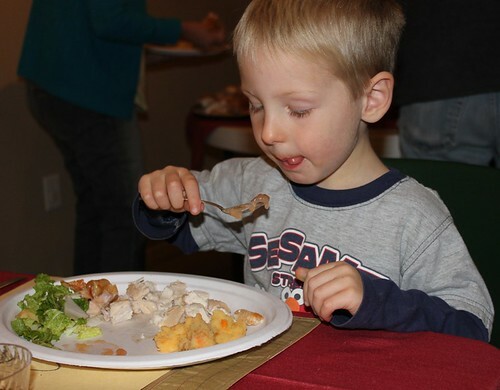 Thanks to sponsorship from the FoodBuzz 24, 24, 24 program, I was able to test out the concept by hosting a kid prepared Harvest Meal with three families on Friday. Preparation started by gathering ingredients. 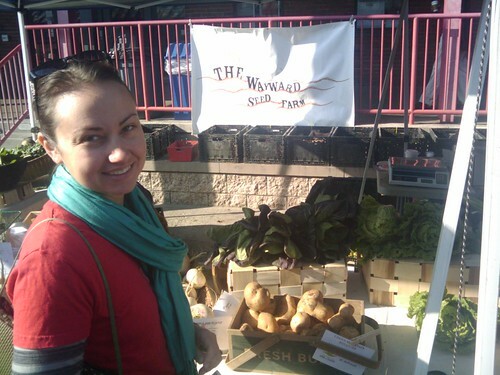 I visited the North Market, Weiland's Market, and farmer friends to gather meat, drinks, produce and eggs. I chose Wild Goose Creative, a local artist cooperative gallery, for the location. Their brick lined deep room with a full kitchen was a lovely venue for our casual and creative meal. When Alex, Lil and I arrived on Friday, we set up tables for ingredients, a work station, a snack table and a craft area. 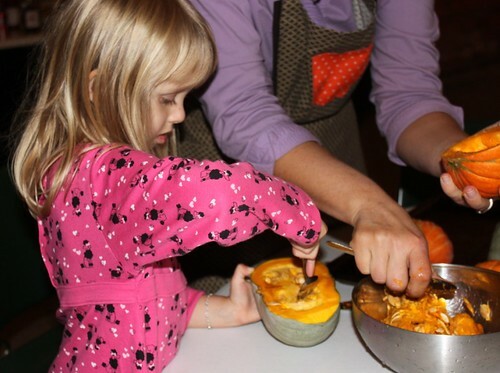 While kids love to cook, my experience is that they also need space to process their experiences through play. When the families arrived, they each contributed a gift to be donated to a local settlement house. We sang a song to learn each others' names. I showed everyone around and explained that the event would be free form. Parents and children could jump in and help cook when they wanted and take breaks as needed. The first task was to make a small snack platter of Middlefield Original Cheese (Middlefield, Ohio) and crackers. I hoped (correctly) that having designated snacks would help kids refrain from eating raw ingredients. 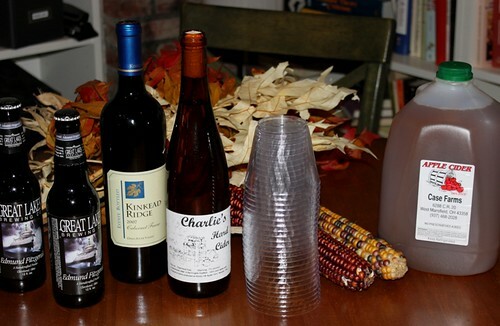 Drinks for the evening included apple cider (Mansfieldm Ohio), Cabernet Franc from Kinkead Ridge Vineyard (Ripley, Ohio), Edmund Fitzgerald Porter from Great Lakes Brewing Company (Cleveland, Ohio) and Charlie's hard apple cider from Windy Hill Apple Farm (Johnstown, Ohio). Next we prepared Speckled Hen farms chickens for cooking. 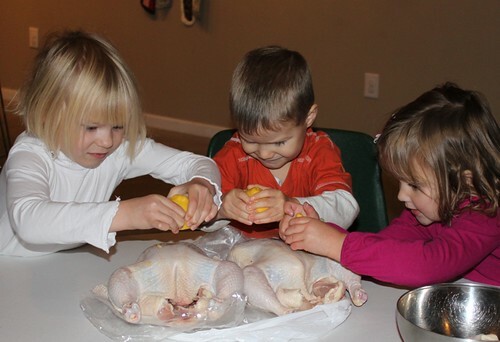 The children doused the skin with lemon, olive oil, salt, and pepper, after which Alex trussed the legs in the tail skin. 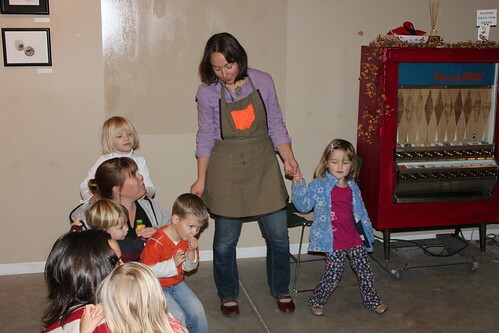 Alex then whisked the birds off to our home oven to reserve the Wild Goose oven for side dishes. Dessert was a pumpkin cake with cream cheese icing made from pumpkins grown in Marysville Ohio. Even the littlest boy in the group helped spice the cake. White and sweet potatoes were chopped and boiled for mashed potatoes. In between cooking tasks, the children played. 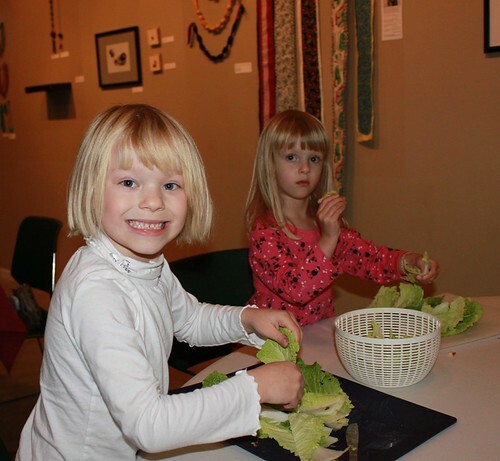 They decorated placemats and made felt flowers for our kid friendly tablescape at the craft area. 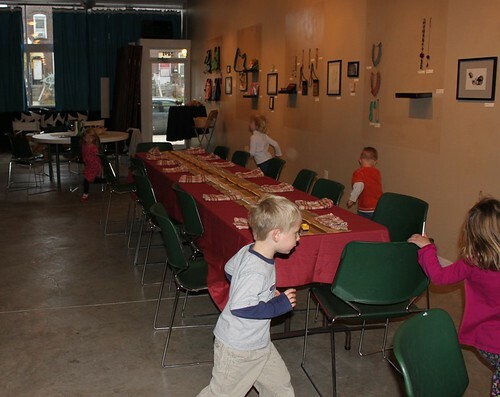 They also ran laps around the tables to burn off steam. We mixed golden Ohio eggs and Snowville Creamery milk into cornbread batter. We cleaned golden nugget and Hokkaido blue squash from our urban garden for roasting. Later, we mixed a filling of onions, garlic, black eyed peas, sharp cheddar, cilantro, and chili powder and stuffed the squash. Ohio cabbage, turnips, and apples were chopped into a harvest salad. Salad dressing was olive oil, Charlie's apple cider vinegar, and oregano from our garden. As all the cooking was going on, families set the dining table. 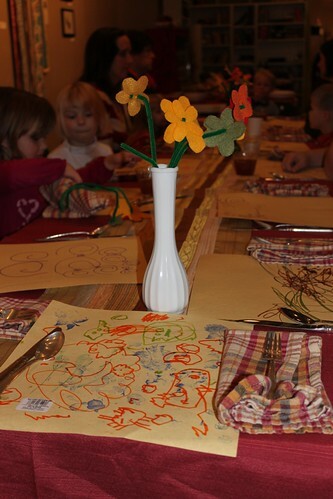 The homemade placemats and flowers were perfect for the kid centered dinner. Finally, we ate our meal together. 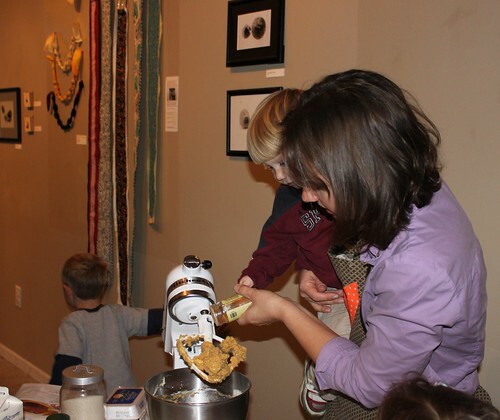 Adults and children bravely tried new-to-them dishes made from seasonal ingredients. We shared thanks for the bounty of the earth and the pleasure of friends. Did you notice my apron in the pictures? It was given to me by Amy D who makes super cute and functional items from reclaimed fabrics. Find an apron for yourself or to give as a gift at The Kickstart and Whole Foods Dublin or purchase online from the Made by Amy D website. 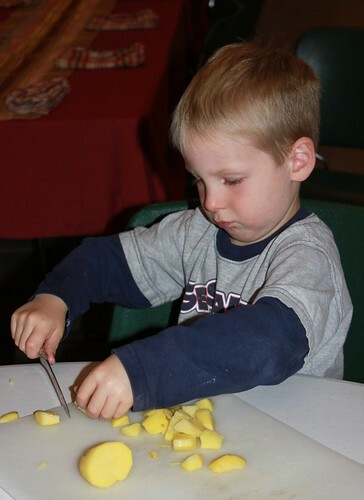 Tuesday begins the December series of Kids Cook classes at Sprout Soup in Columbus Ohio. Join me for engaging hands on lessons and great food!